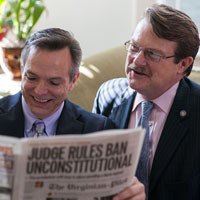 On February 4, 2014, Ted Olson and David Boies made a forceful case in the United States District Court for the Eastern District of Virginia that all Americans are guaranteed the freedom to marry the person they love, and how the harm caused by denying gay and lesbian couples this right is unjustified and indefensible. Arguing alongside them was the Commonwealth of Virginia. Days before the hearing Virginia Attorney General Mark Herring announced that the Commonwealth would no longer defend the law in court. On the other side was the legal group Alliance Defending Freedom, which played a major role in passing California’s Prop. 8. They argued that Virginia’s marriage ban is somehow not discriminatory and that children are best raised by a man and a woman, arguments our legal team resoundingly refuted. District Federal Court Judge Arenda L. Wright Allen promised a swift ruling. “You’ll be hearing from me soon,” she said at the conclusion of the nearly two-hour hearing. On February 13, 2014, the Federal District Court ruled that Virginia’s marriage ban violates the U.S. Constitution. It said that loving couples like our plaintiffs, Tim Bostic & Tony London and Carol Schall & Mary Townley are entitled to the same basic rights and protections as every other American. This was a monumental victory and the first of its kind for a state in the South. The defendants of the case immediately appealed the District Court’s decision to the Fourth Circuit Court of Appeals.